Whether you spend your day hitting the surf or making a splash in school, you can come prepared to face any wave when you pack small, easy-to-lose items in this sleek and stylishly stitched pouch. Made from upcycled, excess wetsuit material that otherwise would have been discarded, this cushy nylon neoprene protects cellphones and touchscreens from scratches and moisture. With its slim profile and expert stich work, this cool clutch provides a smart way to pack the little things to avoid getting in hot water. Made in China. The goal of upcycling is to prevent wasting potentially useful materials by making use of existing ones. This reduces the consumption of new raw materials when creating new products. Reducing the use of new raw materials can result in a reduction of energy usage, air pollution, water pollution and even greenhouse gas emissions. Please note this case is not waterproof. Care: Machine wash cold with like colors. Do not bleach. Hang to dry. Do not iron. 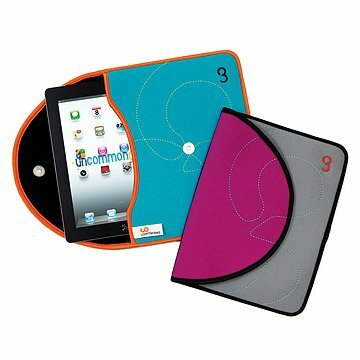 Made to fit the iPad, iPad 2, and any other 10" electronic device. Nice Product. Protects my IPad. This is a great iPad case. It's on the roomy side, at least for the iPad 2. But that means that it comfortably accommodates the magnetic iPad cover as well as the device itself. Keeps my iPad safe, and looks great doing it! Plus, it's up cycled. What could be better? This product is used every day and was well crafted. Magnetic button makes tablet secure yet easily accessible. Made up of materials that would normally be disposed of in a landfill. What is not to like! This is a great product - recycled, useful and stylish. I don't think it gets much better than that! I already have a back cover and film cover for my iPad so I've only been looking for a sleeve. This one was just what I wanted...fun, bright colors, pliable so I can fold it out of the way and the best part - it's washable! So many covers get dirty so fast, this one will stay fresh and looking new for a long time! Come prepared to face any wave when you pack small, easy-to-lose items in this sleek and stylishly stitched pouch made from upcycled, excess wetsuit materials.